As time unravels and her enemies close in, Zahra finds herself suspended between danger and desire in this dazzling retelling of Aladdin from acclaimed author Jessica Khoury." After committing the most heinous sin a jinni could ever commit, Zahra spent the last five hundred years imprisoned inside her lamp. She didn't expect to see the sun or touch the desert sand again, but, one day, a young man called Aladdin discovers her lamp and brings Zahra to a world where her existence is forbidden. Zahra must adapt to this new world and figure out what she is capable of to win her freedom -without losing her heart. 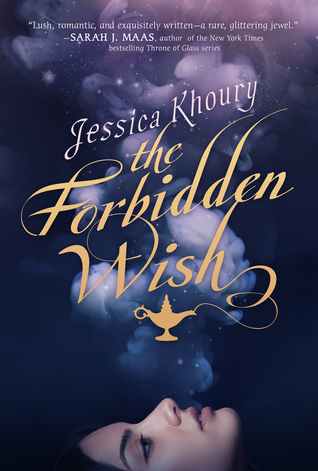 Writing: The Forbidden Wish is inspired by the folk tale Aladdin from One Thousand Nights. It's told from Zahra's POV, who is a jinni (can I say that the idea of making the jinni a girl was genius?). Jessica Khoury's writing is captivating. The way she writes emotions is so vivid that I could feel them. And then, there are these funny moments that make impossible not to giggle or chuckle. All in all, the writing is vivid, compelling, magical. Characters: She may be the most powerful jinni, but Zahra has a soft and vulnerable side that made me want to hug her (yes, I always want to hug fictional characters and tell them everything is going to be okay). For five hundred years Zahra lived in her prison alone, haunted by the memory of what happened to the Queen she loved with all her heart like a sister. Seeing Zahra struggling with her guilt and regret and being in so much pain was very heartbreaking. However, she is not a melancholic character. There were so many times that I laughed at her sly remarks. Zahra is a strong character, ready to fight for her freedom and for those she loves -and Aladdin became one of those. Aladdin is a street rat, a thief and drinks too much. His heart was embedded with revenge after witnessing his parents' death at the hands of the Vizier. However, he had this caring soul -he cared about the others and doing the right thing. For him, Zahra wasn't just a jinni. He saw her as a friend and later she became something more... The slow-burn romance between Zahra and Aladdin is so well-written that I ended up shipping these two with all my heart. Worldbuilding: As I wrote above, this novel is based on the folk tale Aladdin. It does shares a few resemblances with the original tale (the booby trapped cave, the magic ring, the lamp jinni, Aladdin...), but a new world is created -the jinnies ravage the desert, there are magic runes that stop these magical creatures and jinni charmers that enchant them with their music. The author took her time to wave a unique world that can seduce the reader and bring her/him to an otherworldly Arabia. In The Forbidden Wish the tale of Aladdin comes to live once again. PS. There was a reference to Sinbad at the end of the story. Could it be a clue to a companion novel? Great review! I read an excerpt of this and became interested in the world, but I don't really think it's my type of read. I usually tend to dislike Aladdin retellings, so I don't think I'll be reading this one anytime soon. Thank you. :) This was the first Aladdin retelling I ever read. I do have another on my wishlist which I still want to read even though it received (and keeps receiving) awful reviews. I reeeeally want to read this. There are a couple of Aladdin-esque retellings out in the world now, and I want to read all of them. The Wrath and the Dawn was fantastic, so I need more. I also really like the idea of the genie being a girl in this case.